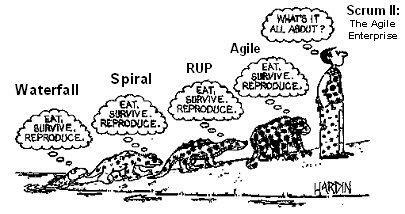 At the Agile 2005 conference in Denver, I presented a research paper on a multi-team, multi-product Scrum which has a daily Scrum-of-Scrums meetings and a weekly MetaScrum where all Sprints are started, stopped, or changed by a broad base of company stakeholders. Thus the entire company runs as a Scrum. The thrust of a Type C Scrum is to enable the entire enterprise to be Agile. Better software and faster development may not be enough to win in the marketplace. You need a Type C Scrum to turn your company into a competitive monster. Check out the slides from my presentation. Since the IEEE format limits text to 10 pages, I have written up a more detailed version which will be published real soon in a short book called "The Scrum Papers." Let me know if you are interested in the long paper and I will send you a draft of the book (but only if you agree to give me feedback on how to make the paper better)!